How many times can one image really be uniquely reimagined? As a professional makeup artist who is continuously nurtured by the creativity and collaborations of artists from around the world, Desireé Delia has often asked herself this question. 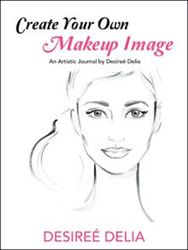 Driven by her desire to find the answer and give people the opportunity to create their own images and explore their creativity, she marks her publishing debut with the release of “Create Your Own Makeup Image” (published by AuthorHouse). This artistic journal is a collection of black and white images meant to spark confidence in creativity and that will mean something different to each person who opens it. Each image can be colored as the readers wish — or not colored at all. It allows one to uniquely reimagine an image once created by someone else and make it his or her own. “Create Your Own Makeup Image” will appeal to anyone and everyone who are looking for a way to have fun, practice or de-stress. To purchase and know more about the book, readers may visit https://www.authorhouse.com/Bookstore/BookDetail.aspx?BookId=SKU-001180757. Desireé Delia discovered her talent for makeup as a model but owes her passion for beauty to her late grandmother — “The Beauty Queen” who never left home without her lipstick. Over the past five years, she has worked with celebrities in fashion, music, television and ﬁlm. Her work can also been seen on the runways in New York and Paris, Vogue Italia, IRK Paris, Imirage Magazine, Volition, Jute Magazine and others. She trained with Chic Studios NYC and Makeup Mastered, working with artists from 80 different countries. She holds a bachelor's and a master’s degree.